Benny Chris Walker died March 17, 2019 in Oklahoma City at the age of 74 years 3 months 6 days. Memorial Services are scheduled for 2:00 PM, Saturday, March 30, 2019 at Wadley’s Funeral Chapel entrusted to the care of Wadley’s Funeral Service. Chris was born December 11, 1944 to Benny and Mary Walker. He was raised in Wayne, graduating from high school in 1963. Chris was inducted into the United States Navy after graduation, and served his country for 4 years. While stationed in Guam, he met Margaret Santos. They were married March 27, 1967. On February 13, 1968, they welcomed their daughter, Anna Lee. Chris worked in construction and was a labor foreman. He had a very long welding career, retiring at the age of 62. 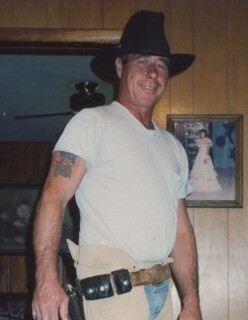 Chris married Debbie Casey on Mary 24, 2002 in Texas. He enjoyed hunting, riding four wheelers at the river, being in the outdoors, spending time with his family and caring wife. Chris is preceded in death by his parents, Benny and Mary Walker. Survivors include his wife, Debbie, of the home; daughter, Anna Diaz and husband, Robby of Lexington; brother, Teddy Walker and wife, Sheila of Wayne; 5 grandchildren, Courtney and Travis Cheatwood of Newcastle, Brandon and Savannah Diaz of Lexington, Cody Diaz of Lexington, Chandelle and Jeremy Scoles of Blanchard, Shawn and Veronica Casey of Blanchard; 6 great-grandchildren, Walker and Scarlett Diaz of Lexington, Haven and Makina Cheatwood of Newcastle, Jaci and Elli Scoles of Blanchard, Margaret Walker of Wayne; lifetime friend and right hand man, Bob Blackwell of Wayne, and a host of other relatives and friends.